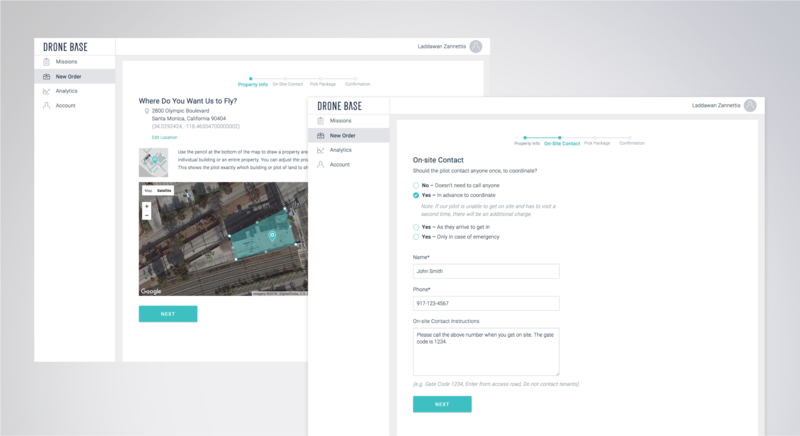 The DroneBase Client Dashboard is the hub for our customers to manage missions quickly and easily. We strive to make placing orders as easy as possible, and regularly update our product to help our customers achieve even more efficiency in their workflow. 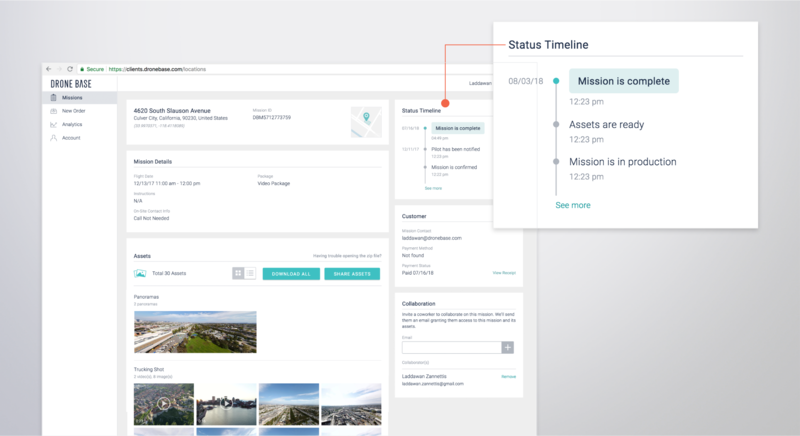 Our most recent updates to the customer dashboard make creating missions easier than ever. Watch the video below, or read on to learn more! Our Mission List allows you to easily sort missions based on what you deem the most important or relevant search terms. Customers can now search by status, and filter by “Upcoming”, “In Progress”, and “Completed”. You will also be able to search by “Location” and “Mission ID”. 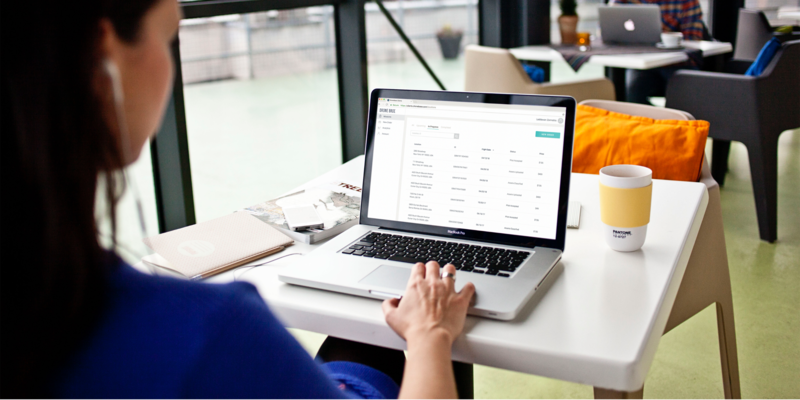 If your focus is on scheduling, you’ll be able to search by “Flight Date” or “Order Placed Date” to easily manage your workflow process and timing. Never again will you have to wonder about which phase your recently-placed Mission is in! Now, you can be updated via our new Status Timeline offering. On every “Mission Details” page, you’ll find a Status Timeline bar that visually depicts the current mission status in real time. Easily see when your flight has been confirmed, when flight was completed, and when your assets have been fully uploaded. Ordering a mission has never been easier! Order your flight within just 5-10 minutes, thanks to our new and improved order flow. The dashboard will walk you through every step of order placement, from property address to any special instructions. We’ve kept this update intentionally simple, so that you can focus on entering clear & correct mission details - we’ll take care of the rest! 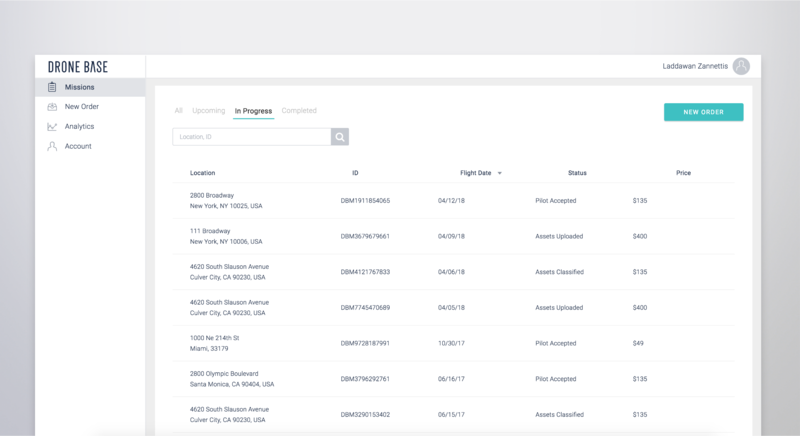 For the first time ever, DroneBase customers can access flight analytics from within the client dashboard. 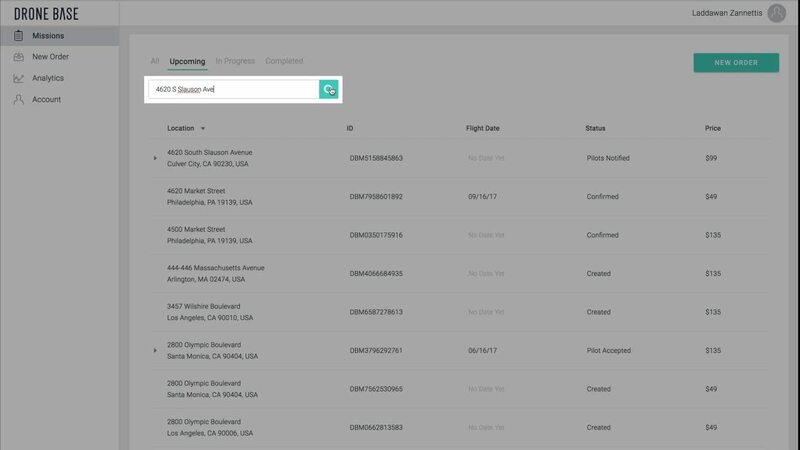 Get a birds-eye view of key data points such as orders placed, average flight value, and more. 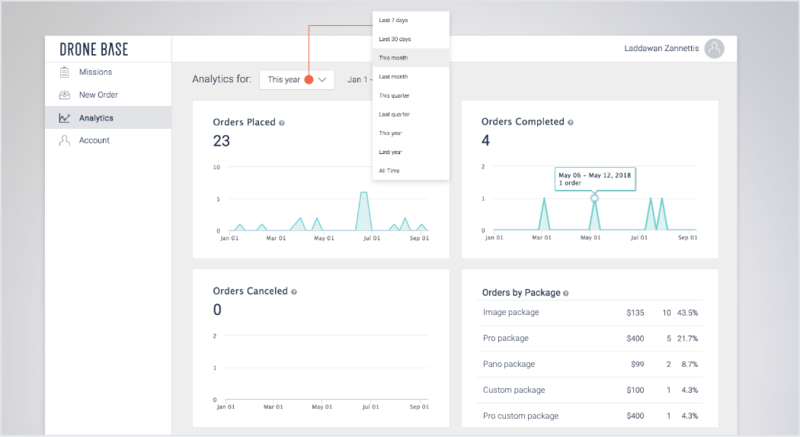 Stay tuned for our next blog post detailing all of the great new analytics features! The DroneBase Team is committed to making your customer experience the best it can possibly be. Visit our new customer dashboard today, to check out our new look and place your next order! As always, if you have any feedback you’d like to share, feel free to reach out to us at: hello@dronebase.com. Erik Till is the Head of Marketing of DroneBase and is passionate about sharing stories of technology making the world a better place, especially related to drones. 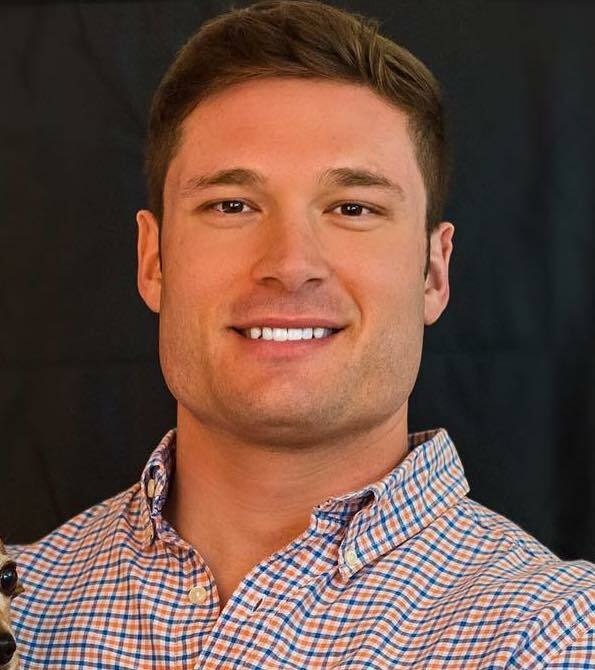 Erik is responsible for the communications and brand of the company, as well as strategy, content, and acquisition of drone pilots and new customer leads. He has worked in startups ranging from eCommerce to design & manufacturing, building marketing and sales programs for both B2C and B2B companies. He holds a B.S. in Business Management and Psychology from San Diego State University.